Mercury rising—are the fish we eat toxic? The amount of mercury extracted from the sea by industrial fishing has grown steadily since the 1950s, potentially increasing mercury exposure among the populations of several coastal and island nations to levels that are unsafe for foetal development. These are the findings of a study carried out by researchers from Université de Montréal's Department of Biological Sciences and published this week in Scientific Reports. The study combined data on the amount of mercury fished out of oceans and seas from 1950 to 2014 and the weekly consumption of fish and seafood by the populations of 175 countries between 1961 and 2011. By comparing this data, which was published by the Food and Agriculture Organization of the United Nations (FAO), postdoctoral fellow Raphaël Lavoie was able to estimate these populations' per capita intake of methylmercury (MeHg), a highly toxic form of mercury. Working under the direction of Professor Marc Amyot, Lavoie estimated that the people of 38 per cent (66 of 175) of the countries examined by the study might be exposed to methylmercury levels higher than the maximum deemed safe for foetal development. The highest-risk countries include the Maldives, Iceland, Malaysia, Lithuania, Japan, Barbados and South Korea. When humans ingest excessively high levels of methylmercury, the toxin's molecules can penetrate the blood-brain barrier and impact cerebral development, especially in children and foetuses. Industrialization has released vast quantities of mercury into the atmosphere, which have settled in oceans and waterways. This mercury is absorbed by sea creatures, many of which are consumed by humans. Since 1950, demand for seafood has skyrocketed while technological breakthroughs have enabled more intensive forms of industrial fishing. Since the 1990s, when overfishing drastically reduced stocks, industrial fishing has gradually migrated to deep-sea and international waters. "The global marine catch totals 80 million tonnes of fish per year, which means that we are also pulling out increasingly large amounts of mercury," said Amyot. Of the industrial fishing areas listed by the FAO, the Northwest Pacific currently exports the most fish – and the most methylmercury. The Western Central Pacific holds second place, while the Indian Ocean ranks third. "Together, these three fishing areas exported 60 per cent of the mercury resulting from global seafood production in 2014," said Lavoie. The people in these regions are some of the world's top seafood consumers. Species high up on the food chain contain the highest concentrations of mercury. From 1950 to 2014, large fish represented approximately 60 per cent of the global catch (by weight) and nearly 90 per cent of the mercury ingested by consumers from fish. To be safe for foetal development, the threshold for methylmercury consumption is 1.6 micrograms for each kilogram of a person's body weight per week (1.6 μg/kg/week). "By comparing FAO data on global seafood consumption, we observed that from 2001 to 2011 the populations of 38 per cent of the 175 countries we analyzed would have been exposed to weekly doses of methylmercury far above the maximum safe level of consumption for foetal development," said Lavoie. "Many of these populations are in coastal and island nations, especially developing countries." For instance, during that 10-year period, people in the Maldives would have consumed an average of 23 micrograms of methylmercury per kilogram of body weight each week, or more than 14 times what's deemed safe. The next highest-ranking were people in Kiribati (8 μg/kg/week), Iceland (7.5 μg/kg/week), Malaysia and Samoa (6.4 μg/kg/week), French Polynesia (5 μg/kg/week), Lithuania, Japan and Barbados (4.8 μg/kg/week) and South Korea (4.7 μg/kg/week). By contrast, the global average for mercury exposure over the same 2001-2011 period was estimated at 1.7 μg/kg/week. In Canada, exposure totalled 1 μg/kg/week. Lavoie and Amyot said their estimates are conservative. 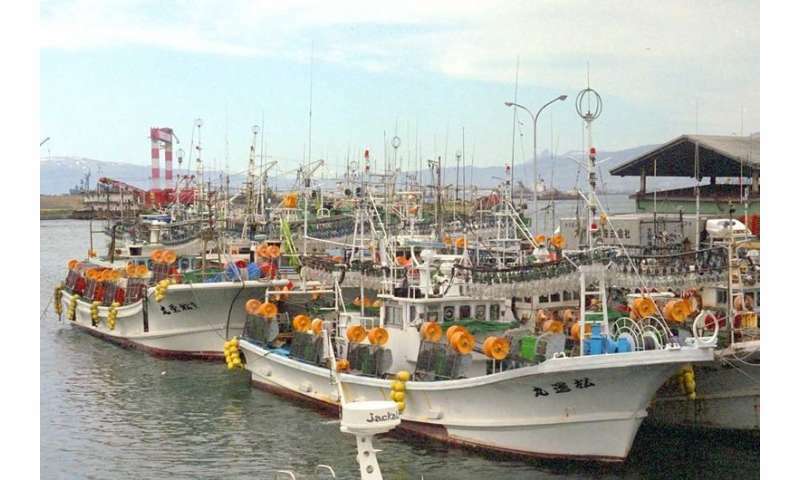 The global catch by the fishing industry, including artisanal and illegal fishing, is probably 50 per cent higher than the FAO data indicates, they said. Ways to reduce the risk? Both researchers believe these estimates could help authorities find ways to reduce the risk of mercury exposure, especially among high-risk populations such as children and pregnant women. Some methods of preparing and consuming fish seem to reduce the risk of methylmercury contamination, they pointed out. In a recent study, they found that cooking fish or consuming it in combination with certain polyphenols contained in foodstuffs like tea could reduce the bioavailability of methylmercury in the human body.